Enjoy prime rib any day with this recipe. 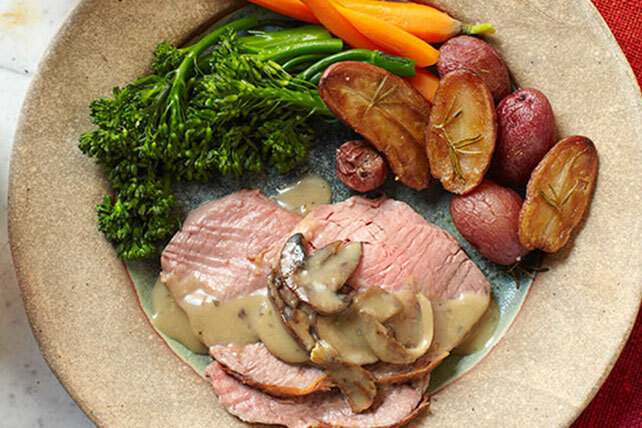 Our Prime Rib with Marsala-Mushroom Sauce sounds like special-occasion fare, but it's surprisingly easy to make. Place meat in shallow pan; sprinkle with 1/4 tsp. pepper and salt. Bake 2 to 2-1/2 hours or until internal temperature of meat reaches 145ºF. Let stand 10 min. (Temperature will rise to 160ºF). Meanwhile, melt butter in medium saucepan on medium heat. Add mushrooms; cook and stir 3 min. Stir in flour, mustard, herbs and remaining pepper. Gradually stir in broth and wine; cook and stir on medium heat 4 min. or until thickened. Serve with smart sides, such as your favorite hot steamed vegetable and a crisp mixed green salad. Ask your butcher to loosen the meat from the ribs and tie the roast together. After roasting the meat, remove the string before carving the meat. You'll get the flavor from the bones without the hassle of having to carve around them.